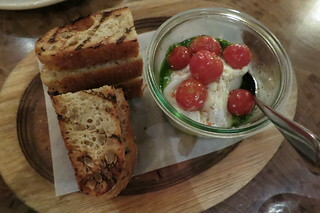 Pizza fans in Los Angeles are already familiar with chef Jeff Mahin's name and the two Stella Barra locations in LA (it's been so long ago that I've written about it, back when the restaurant was still called Stella Rossa). 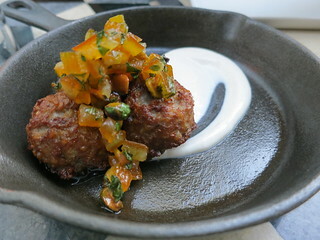 Chef Mahin is bringing Southern California to the east, though, and I was reunited with his food while visiting Washington, DC. 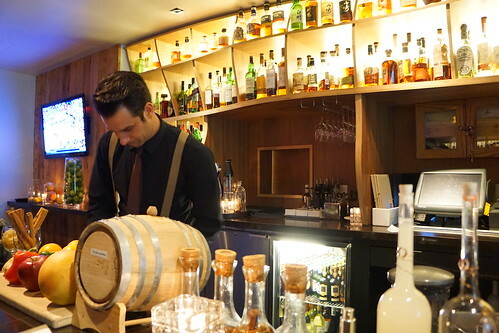 You see, Jeff Mahin is also in charge of another restaurant from the same group, called Summer House Santa Monica. 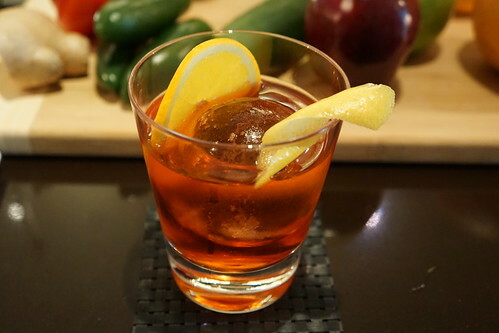 Summer House currently has two locations: Chicago and North Bethesda in Maryland (if you're geographically challenged, that's a stone's throw away from DC). 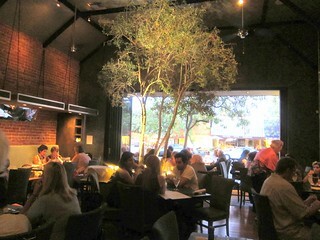 The interior evokes that beach house ambiance, as one would expect, but they've done it better than what I had imagined. 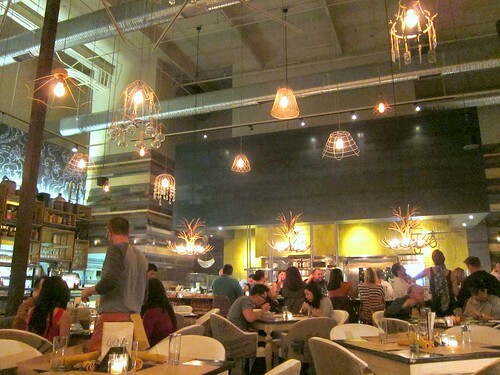 I love the lights hanging from the ceiling! 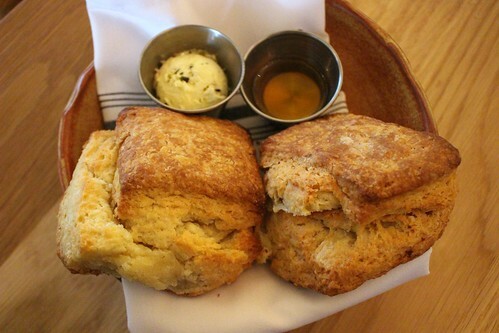 The biscuits, which are served piping hot, are incredible, perfectly flaky and buttery. 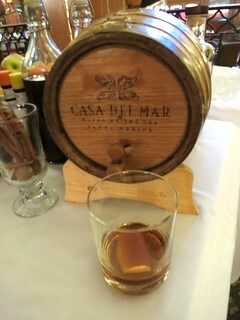 Combined with the honey, it's even better. I knew I had a big dinner ahead of me, but I couldn't stop eating it. If you're particular about the toppings you want on your pizza, try Pizza Rev in Studio City where you can select the cheese, toppings, and sauce for your individual, customized pizza. It's similar to 800 Degrees in Westwood but cheaper. In fact, at Pizza Rev your very own crafted pizza will cost $7.95 despite how many toppings you put on, although there are some premium options that cost extra like gluten free crust or burrata (or vegan "cheese"). You go down the line and ask for or point to the toppings you want. It's hard not to go overboard when everything is in front of you. 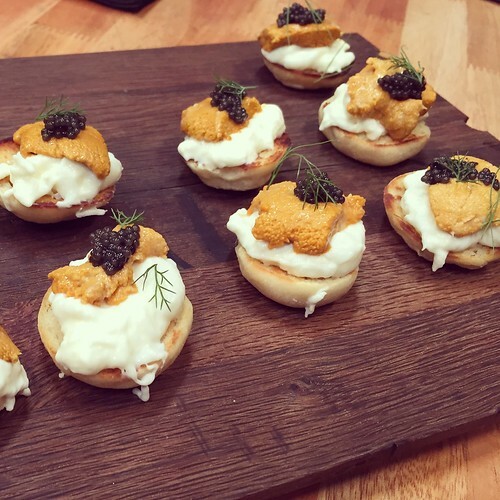 Before Vartan Abgaryan exited Public Kitchen and Bar at The Roosevelt, he and Executive Chef Tim Goodell left them with a solid Fall menu. 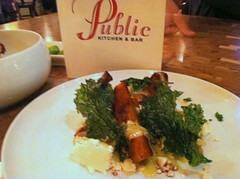 The pumpkin spice vinaigrette was so good, this dish was almost like eating a savory pumpkin pie. Vitello's in Studio City was an old school Italian restaurant in Studio City famous for being a mafia hangout in the 50's and the site of the Robert Blake shooting incident. If you were to ask the current staff, even they will admit that the food back then was no bueno. All that changed recently. 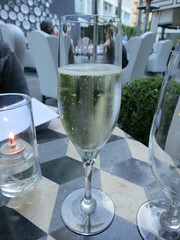 Major renovation of the interior, an entirely new menu under a new chef (who for once is actually Italian), and a wine and cocktail program. 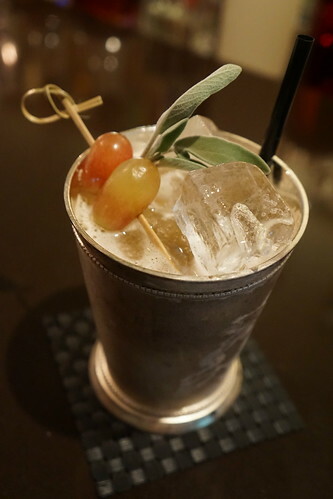 The cocktail menu was pretty interesting. 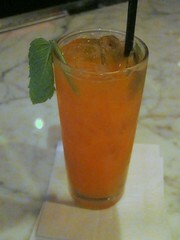 I ordered the Bad Lil' Wabbit made with whiskey, carrot juice, agave, lemon, mint, and ginger beer ($11). I was wary at first. Carrot juice? 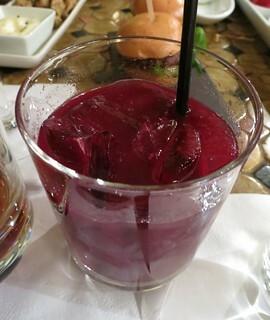 But this drink was good! The ginger beer complements it nicely. The chef likes to put out special items and customers can pretty much request whatever they wanted, as long as they have the ingredients. 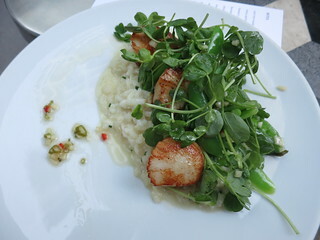 My dinner ended consisting of dishes not on the regular menu (except for the dessert). 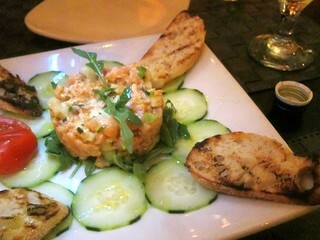 Fresh salmon tartar was served with diced apples and cucumbers. 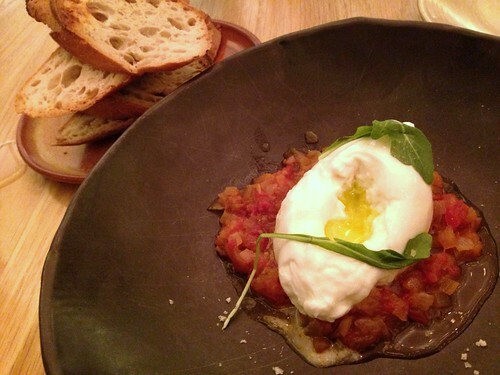 A big mound of smooth, creamy burrata is served with sweet and crisp heirloom tomatoes. 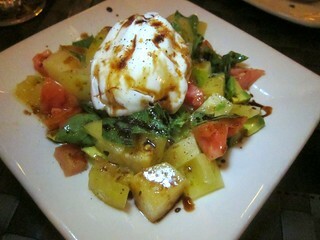 I welcomed every chance I got to eat heirloom tomatoes before the season ended. 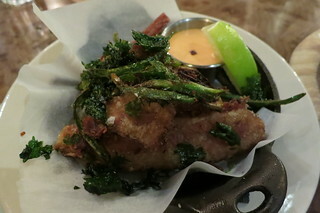 Cucina Enoteca is the new restaurant at Irvine Spectrum, the second venture of Cucina Urbana in San Diego. 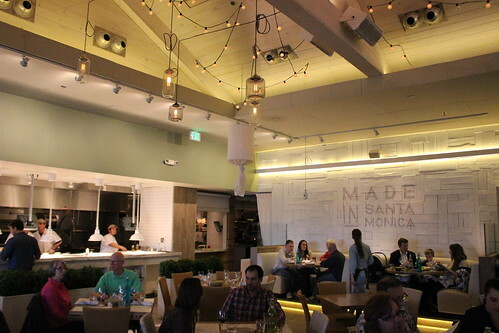 The decor in the large space varied from a rustic patio, a high ceiling with caged bulbs in the dining room, and abstract painting in one section of the wall. 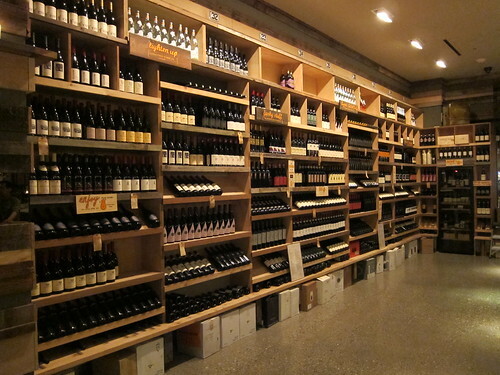 Cucina Enoteca has an adjoining wine store, where you can pick out wines at retail price and pay minimum corkage (on Sundays, you can get free corkage for any bottle over $20 that you buy here). 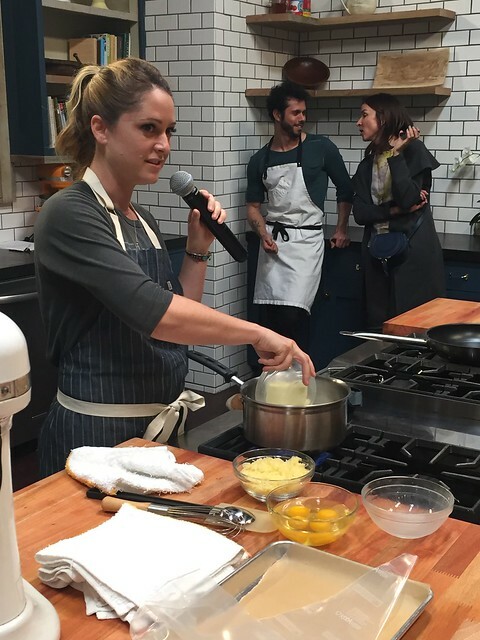 The kitchen is now headed by Chef Lauren "Lulu" DeRouen (formerly of Pinot Provence). She wasn't in the kitchen the night I was there so I ordered instead of having the kitchen send out stuff. They did anyway! 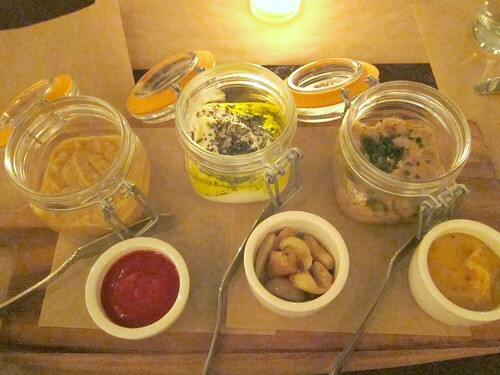 The kitchen sent out a trio of vasi : ceci bean hummus with piquillo jam, burrata with roasted garlic confit, and duck rillette with apricot mustard. 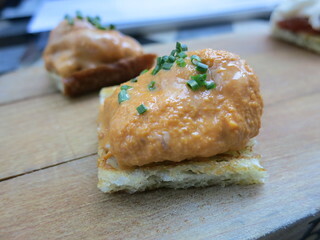 All three were great - I also enjoyed combining the burrata with the duck rillette together. 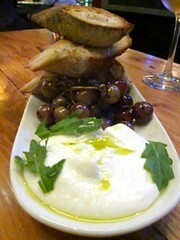 The fresh, creamy burrata is made by DiStefano Cheese in Baldwin Park (the same one they have at Stella Rossa Pizza). 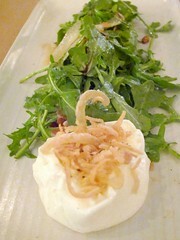 I didn't realize they were sending out the burrata vasi, so I had ordered the burrata and speck ‘caprese’ salad, with pickled pear, arugula, candied pecan, fried shallot, and sherry vinaigrette. 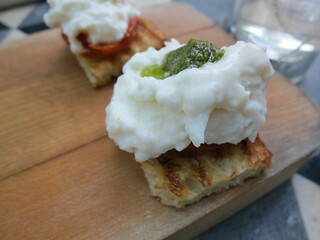 Well, I didn't really mind more burrata, and this one was great especially with the pear.